I created this card using the Queen and Company Lines Shaker Card kit. 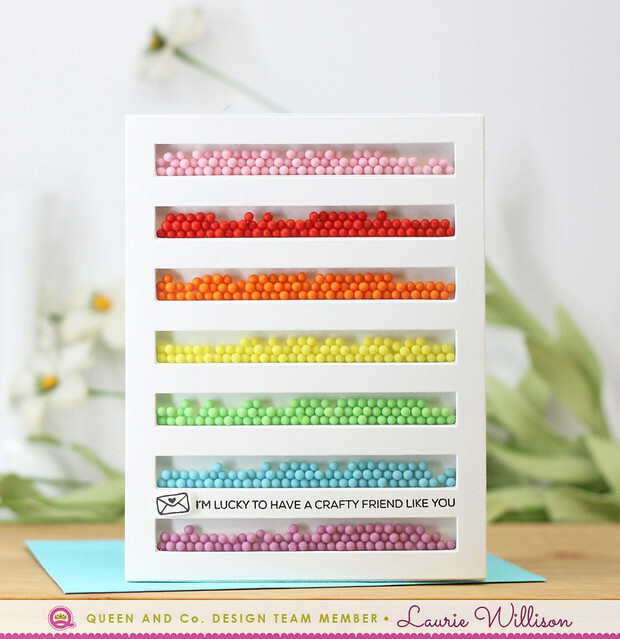 These cards are so very easy to put together as everything comes in its own kit. (Kits linked below). I used the Pops toppings set to create the rainbow shake. Last, I used my Misti to stamp the sentiment and added in the little stamped envelope. I divided each color of the Pops Toppings in little baggies for each of 14 kits. Each guest will get the Lines Card Kit. I used the Lines Card Front Die to make my own Card Front out of Neenah cardstock, but the kit comes with a card front you can use too. In the tool kit, I added Queen and Company's Topping Trays. 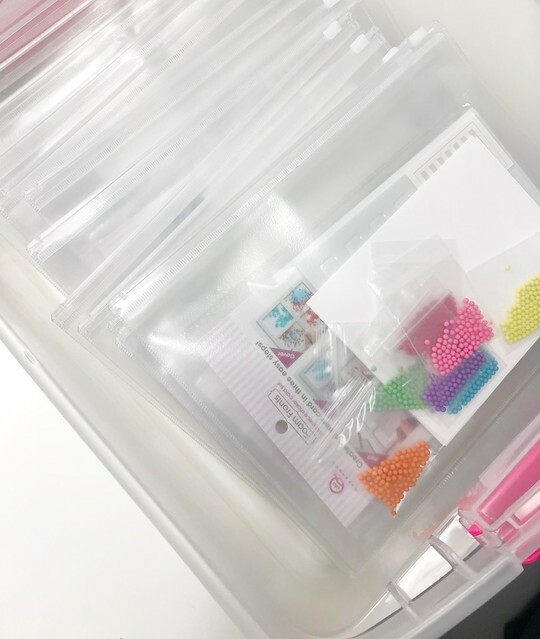 These are amazing to keep all the little toppings in one place and then the ends will twist off so you can pour your toppings back in their storage container. No lost toppings! I also added in a jewel picker upper (from Hobby Lobby). This helps if you get the wrong color topping in the wrong rainbow slot. :) I also put the sentiment on a block as well as the little envelope and a black ink pad. 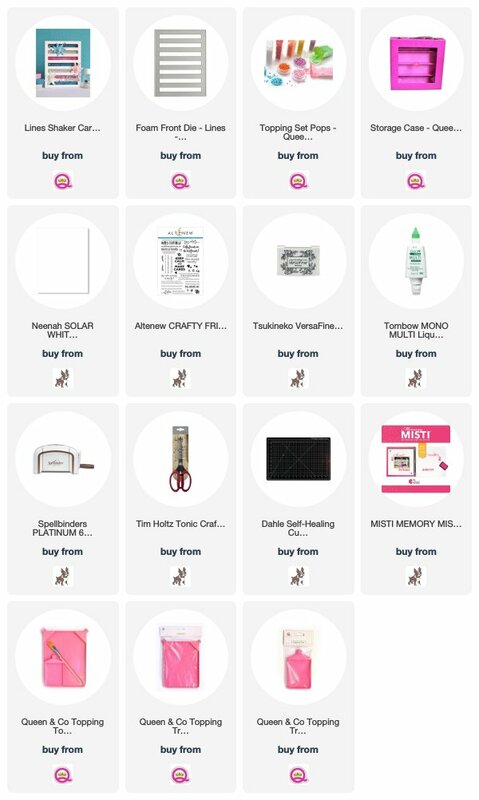 Everything in one place to create their own shaker card. I can't wait to pass out my card kits. I know my friends will have fun creating their own shaker card. So glad you stopped in today! Hope you have enjoyed my creation! It's just like the rainbow stairs! They will love this! I love this! really cute! 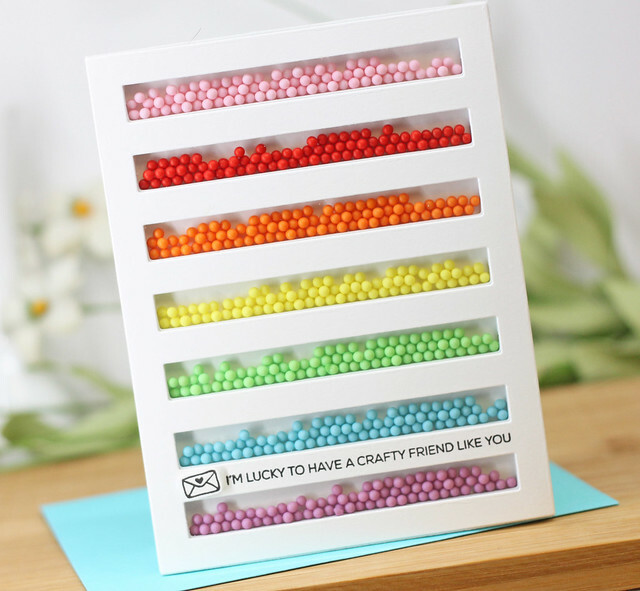 love this idea for a craft night/retreat! I absolutely love this. I love exchanging card kits. This one is amazing. Your friends are going to be so happy. Have fun! Now THIS is fun! 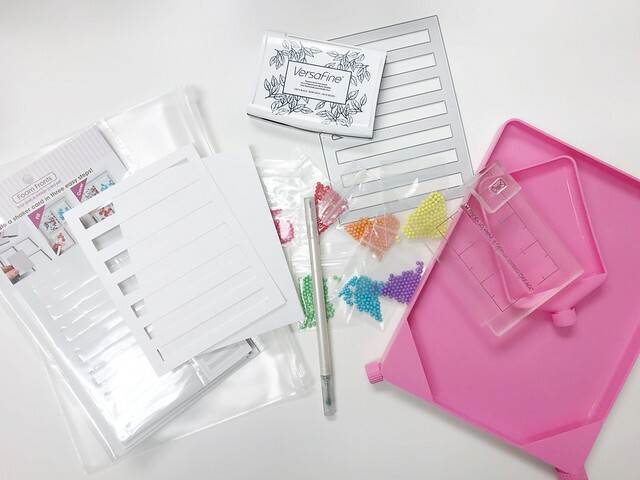 What a great little kit for all of your crafty friends. Have a great time! This is such a pretty shaker card, Laurie! Your crafty friends are going to be very excited to re-create your project...Have fun at the craft retreat! WOW, Laurie, you are going to be the Queen of Kits! Your card is amazing and so is that kit with tools and all. Have a great time crafting with friends!